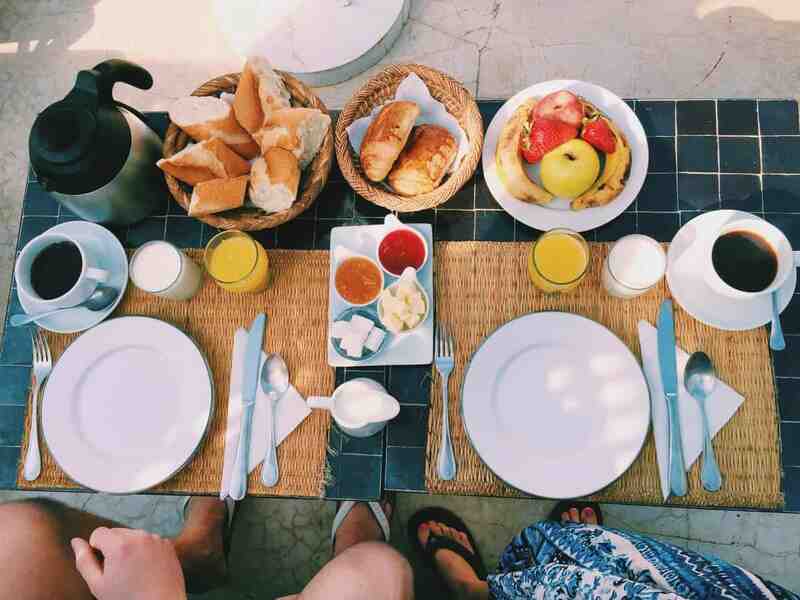 I’m wrapping up my posts on our trip to Morocco with some of my top tips and experience of eating gluten free in Morocco – it’s not only doable, but I found it enjoyable, largely stress-free, and I never got ill – all things that surprised me! and hope that they understood my disjointed French. Which they did! I would also (always) recommend traveling with a translated gluten free dining card. This can be especially useful if you are traveling out of major cities where people are less likely to be able to communicate with you in English. I recommend Jodi’s highly researched dining card here. When traveling gluten free in Morocco you are going to rely on tagine. And more tagine. Did I mention tagine? This is an absolute staple dish in Morocco, and it’s naturally gluten free. 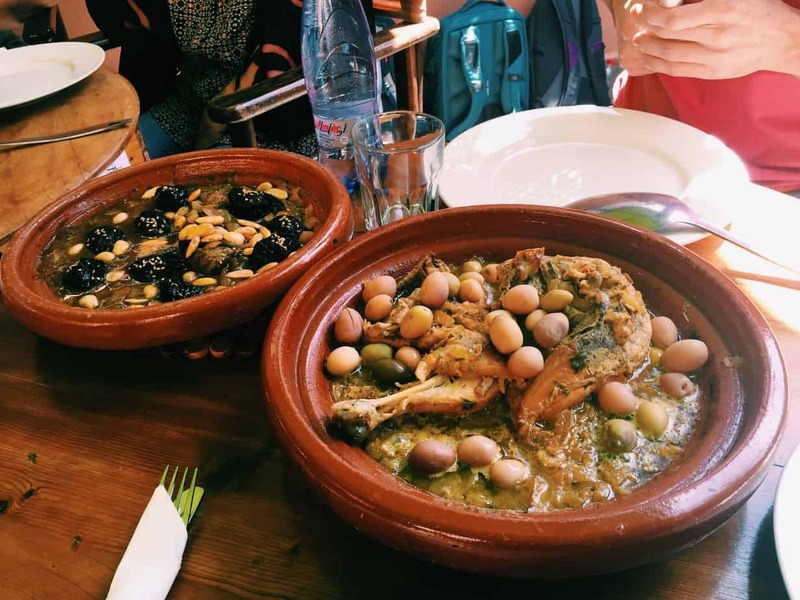 There are lots of types of tagine – chicken and lemon is the classic, but you’ll also find beef and prunes, lamb, and vegetable. I had tagine almost every day and tried to experiment with different kinds so as not to get too sick of it. Luckily it’s really tasty and most restaurants have their own spin on the classic dish. You’ll find tagine sold even at the smallest shack restaurant out near the desert, so you’ll never be without a GF option! *note: Tagine is often served as a communal dish with bread to dip. Make sure you either get your own serving first, or don’t order the communal version! I often had fruit and yogurt for breakfast – stick to the naturally GF options. Moroccan restaurants also commonly sell omelettes (due to the French influence) so if I wanted a lighter lunch I would order this – it’s not your average omelette and is a bit spicier and oilier but I loved the taste! Our lovely riad served me omelettes and yogurt for breakfast instead of the normal gluten-y option, which I so appreciated! ^ tagine in the mountains! 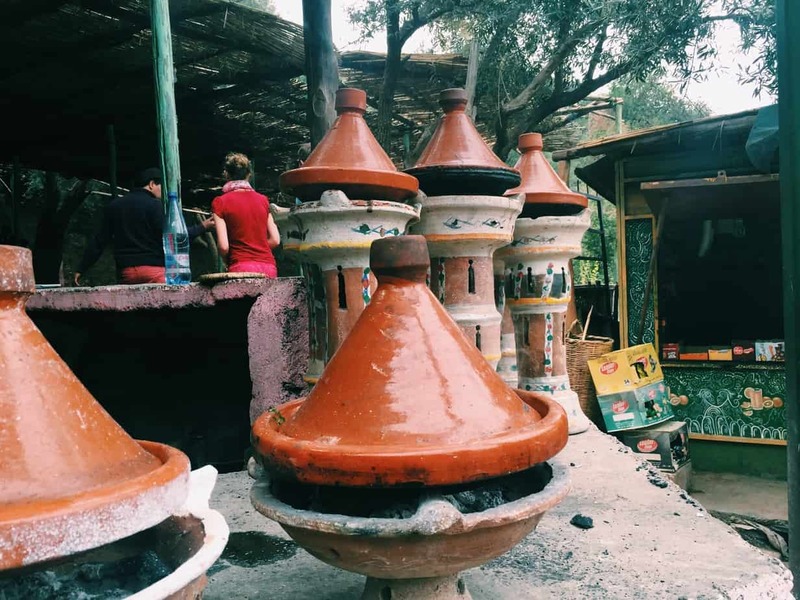 Moroccans love their bread – but you’ll be hard pressed to find the street oven containing artisanal gluten free dough. Be careful if you eat tagine in a group because it’s often served with dipping bread. I had to swipe up my tagine first on our night in the Sahara Desert. Couscous. Another classic dish is couscous – made from durum wheat. It’s basically tiny pasta, so it’s a no-no. If you’re dining at your hotel, you could ask for the couscous to be cornmeal or rice. Our riad was able to accommodate this which was a fun surprise! However, most restaurants in town can’t accommodate this/won’t understand why you’re asking. Harrira. This is a famous Moroccan vegetable soup. It’s almost always thickened with flour. 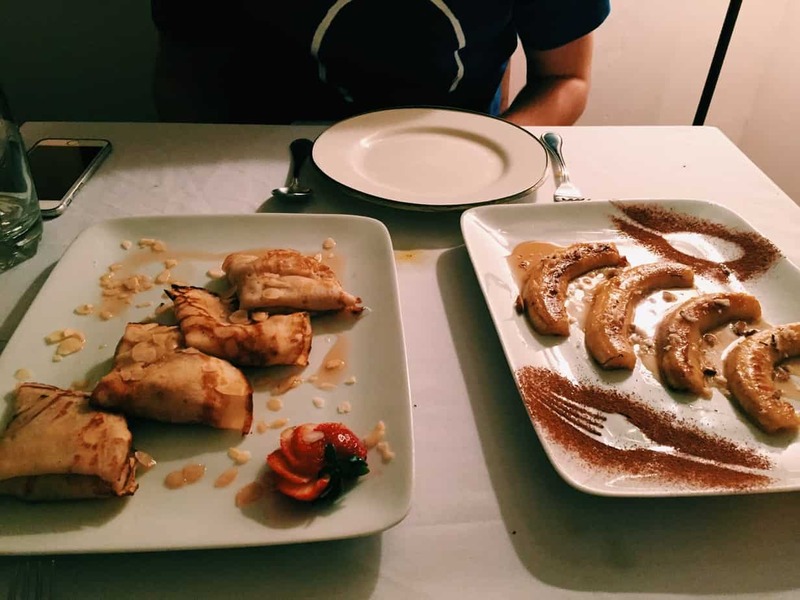 ^^ Desert at our riad… Dan got nice crepes but I was pleased with my sweet cooked bananas and nuts! We spent most of our time in Morocco based out of Marrakech. I didn’t spend my time in Marrakech really hunting down specialty gluten free restaurants like I usually do, as I was quite satisfied with tagine. 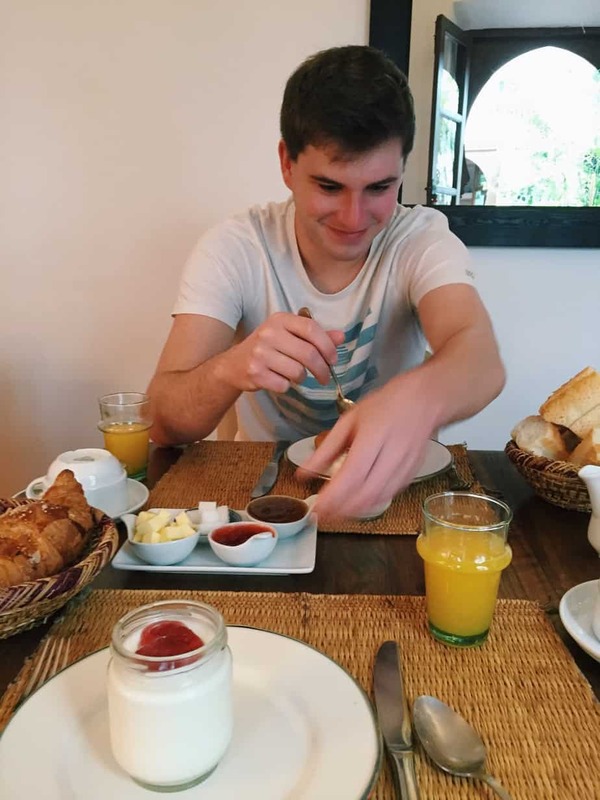 Marrakech was also incredibly crowded so it was difficult to navigate to specific restaurants/locations – it was much less stressful to just eat where we happened to be when we got hungry! I did, however, share a list of the restaurants we went to in my 9 Secrets of Marrakech post. If you missed it, here they are again! Souk Kafe – located in the north entrance to the Souks, cozy and pretty quiet. Really tasty food for a good price. You need to get the specialty tangia here – they cook this for over 24 hours and you can’t find it elsewhere. 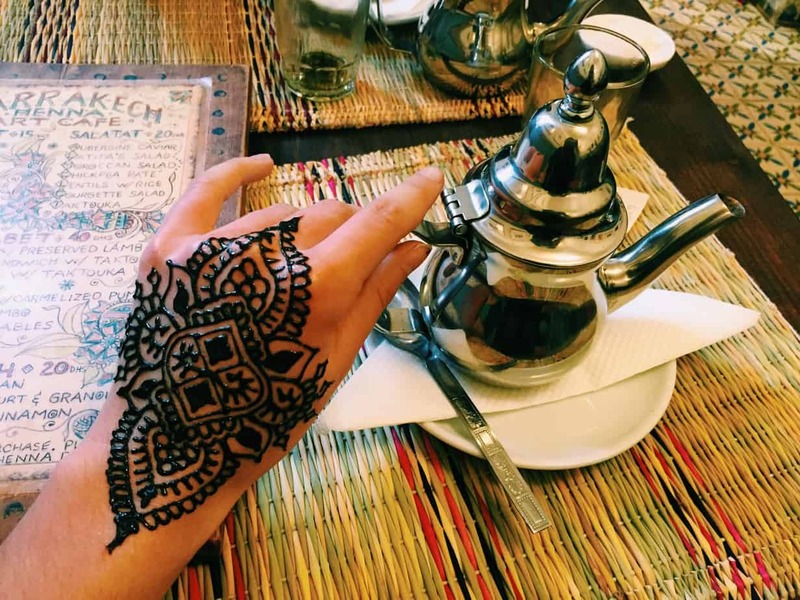 Marrakech Henna Art Cafe – a cute cafe south of Jemaa el’Fnaa. This is the best/safest place to get henna done as well! The women who do henna here are true artists and get fair pay, and the quality of the henna won’t burn or infect your skin. Cafe Arabe (sunset) – a great view of the sunset. Cafe des Epices – tall restaurant in a more open area of the souks… has really good Western options like chicken and french fries if you’re getting sick of tagine! Kozybar – a fancy-ish bar near the spice market. Good view from the top, we really liked the salad tasting plate which was gluten free. Taj’in Darna – truly underrated restaurant! We ate here three times. It’s incredibly cheap for how good the food is – right next to Jemaa el-Fnaa and a minaret so you can listen to the call to prayer while you eat dinner and people watch the busy square. 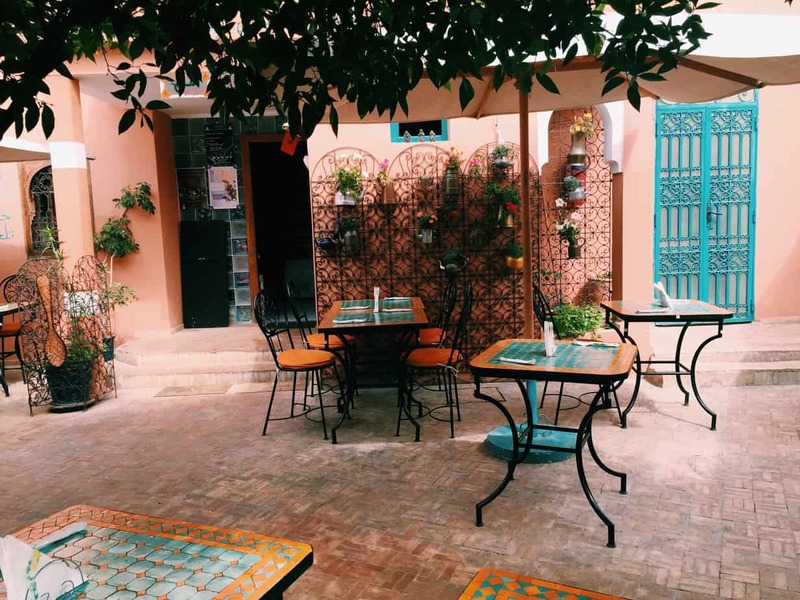 Amal Women’s Training Center – Best rated Marrakech restaurant on tripadvisor, this restaurant is also a charity training center for disadvantaged women. And the food is out of this world. We did a cooking class here and learned to make our own (gluten free!) tagine. 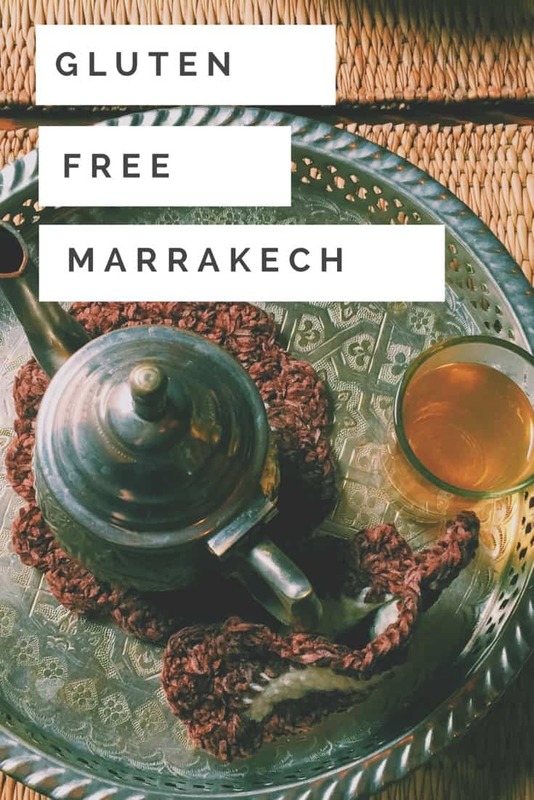 Where to Stay in Marrakech if you’re Gluten Free! I highly recommend staying at Riad Dar Zaman in Marrakech if you are gluten free. It is a small, boutique riad that is elegant yet affordable (even on a student budget like we were on!). It is owned by a British expat but the two men who work there are locals from Marrakech. Their names are Hassan and Yassine and they were so friendly and helpful, about everything and especially about being gluten free in Morocco! We stayed up late into the night chatting to Yassine. Riad Dar Zaman catered to my gluten free needs with special breakfast omelettes and poached bananas with caramel sauce for dessert. 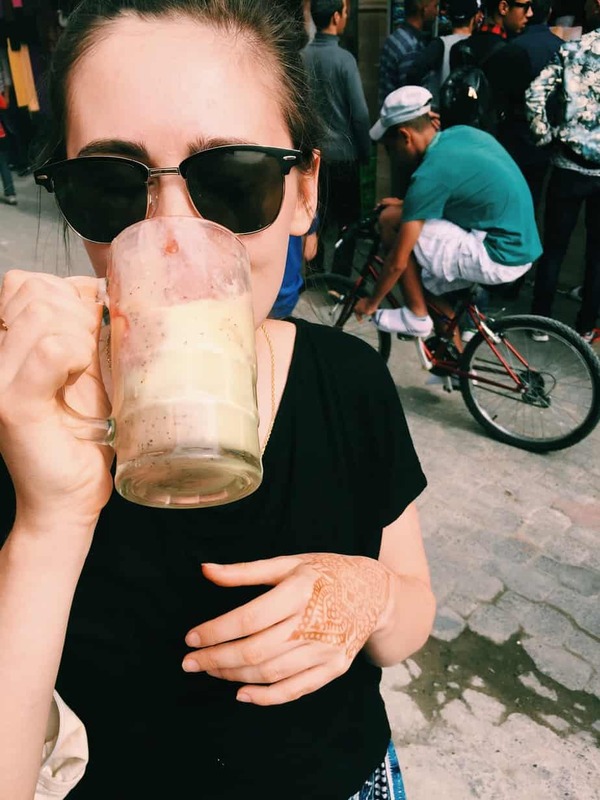 It truly made being gluten free in Morocco so much easier for me! 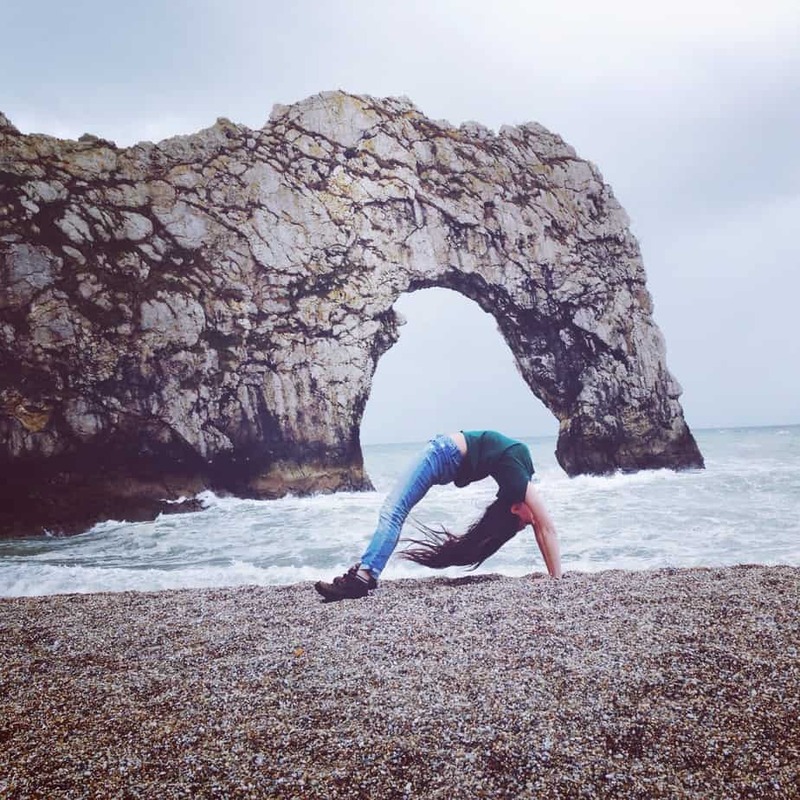 As a side note, our stay wasn’t sponsored at all, I just found them online and we loved our stay so much I have to mention it for other gluten free travelers. Happy traveling! Have you been to Morocco on a gluten free diet before? Any other advice? Let me know! 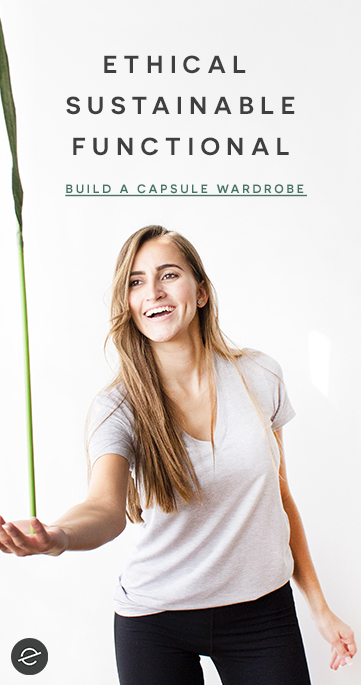 *This post contains some affiliate links. I may make a small commission if you make a purchase through one of my links, however this comes at no extra cost to you! Thank you for supporting Endless Distances.